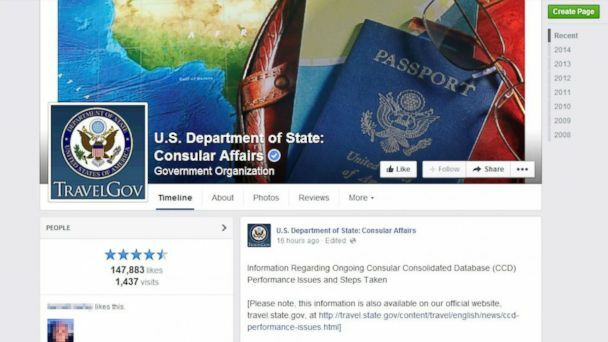 A screenshot made on July 31, 2014 shows the U.S. Department of State: Consular Affairs page on Facebook. (Facebook). International students and others looking to travel to the United States this fall are concerned about whether glitches in the State Department's visa processing system will prevent them from getting their travel documents on time - and have taken to social media to vent. The system for processing and printing visas has been at least partially down since July 20, and a steady backlog of visa cases means frustrated travelers are looking for answers. For many, the first place they turn is Facebook and, perhaps to their surprise, the State Department is responding. "I did my F-1 visa interview in Luxembourg on 21st July. However it's been 10 days. We get continued contacts with the embassy and they said they cannot process anything right now, but isn't the system partially working?" asked Allen Liu, who studies at UCLA, on the State Department's Consular Affairs Bureau page Thursday morning. Consular Affairs responded to Liu six hours later: "Hi Allen, it sounds like our colleagues in Luxembourg are aware of your case and doing what they can to assist you and others like you who are anxiously awaiting visas. Thank you for your continued patience." Another complainant, newlywed Laura Johnson, also fretted about her travel arrangements. "As I will miss my honeymoon to Florida now due to this, what's the best way to get my passport back so at least I can go somewhere else? At the rate the London embassy replies to emails most of the honeymoon time off will be over before I get a proper answer," Johnson wrote. "Hi Laura, we are truly sorry that you will not be able to enjoy the honeymoon you've planned. We are still issuing many visas, however, at a reduced rate," Consular Affairs replied. It's unusual to see the federal government react so personally - and relatively quickly - to individual complaints. But in the interest of damage control, State has to cast a wide net in this case to reduce confusion among people all over the world who might not have much experience dealing with government red tape. "In addition to communicating through our websites, e-mail and letters, we are also reaching out to applicants via Facebook and other social media sites, such as Weibo [a Chinese microblogging site], to relay the latest information," according to a Consular Affairs FAQ page on its website. Plus, State isn't sure when this problem will be fully resolved. There have been "performance issues" since Consular Affairs performed upgrades on its Consolidated Consular Database, the hub for all visa and passport applications, on July 20, spokeswoman Marie Harf said Wednesday. "We anticipate it may take some time before we process all of the pending cases created by the performance issue," she said. The Consular Affairs bureau is working with Microsoft and Oracle, the makers of the database's technology, to fix the problem, which it believes is related to outdated hardware and software, as opposed to something malicious like a virus. Meanwhile, passports are still being processed in a timely fashion. But the glitches prevent embassies from physically printing visas for individuals looking to come to the United States. For students seeking admission to the U.S. for the fall 2014 semester, which for many colleges starts in August, Consular Affairs is already recommending a Plan B: making arrangements with their school's administrators for starting their studies after their program begins. But that was little consolation for Liu, the UCLA student, who wrote back to Consular Affairs on their Facebook page. "I have my summer course next Monday," he wrote. "I desperately need the visa as soon as possible."